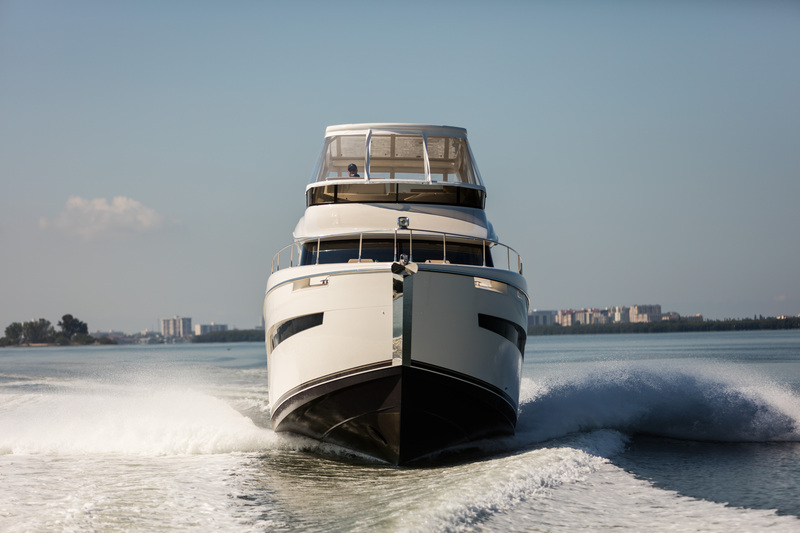 The remarkable C52 Command Bridge has the distinction of being the largest flybridge cruiser in Carver’s growing feet of newly designed contemporary yachts. The C52’s impressive framework allowed her designers to capitalize on the special benefits and styling advantages created by employing a striking axe bow and high freeboard architecture. The extra space and performance benefits of this design carried forward from the smaller C36 and C40 with even more dramatic results on the C52. 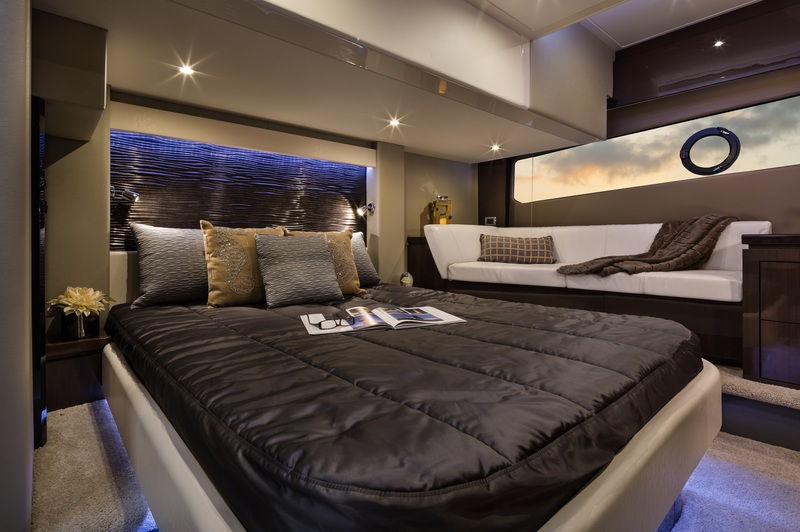 The C52 Command Bridge is a three-stateroom, two-head yacht with one of the most expansive layouts of any yacht in its class. Its spacious, open-concept main deck layout, full beam mid cabin master suite with private entrance and the enormous bridge deck are some of the unique highlights of a long list of the well thought out amenities to be found on this yacht. 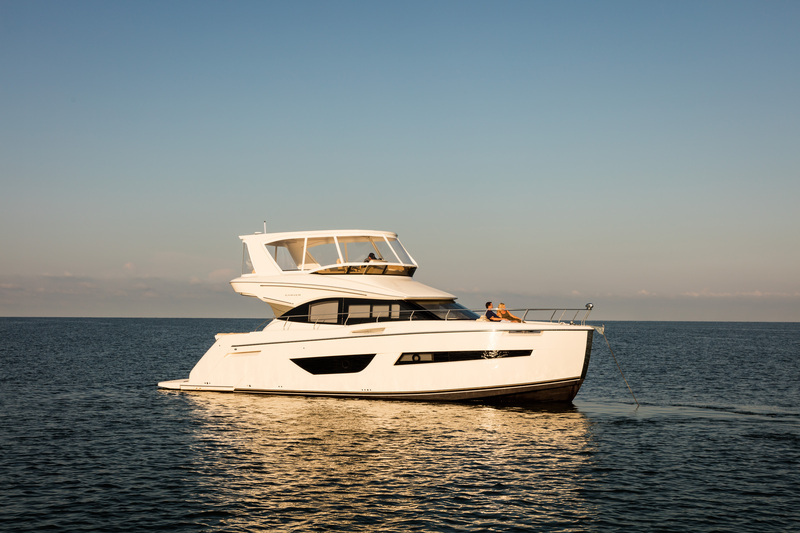 The C52 series is one is one of the most exciting new model introductions in Carver’s storied history. The C52’s optional enclosed and air-conditioned Command Bridge offers a truly remarkable platform to operate this magnificent yacht while enjoying the company of your guests. The spacious layout and attention to detail that you would expect from Carver’s years of experience in producing world class productions yachts is evident along every inch of this space. Carver’s manufacturing operation is unique in the industry possessing in house capabilities for components usually left to sub-contractors. Craftsman produce cabinetry, upholstery, and do metal fabrication in on-site workshops where the boats are built. This horizontal integration allows for increased quality and customization not seen in this type of production yacht. As a flagship of Carver’s Command Bridge line up the C52 had a lot to live up to. The C52 has distinguished itself as worthy. Carver has a history of listening to what yacht owners want and delivering innovative designs for discerning cruising yacht owners. The C52 blends styling with impressive luxury, comfort, and performance. Carver will continue to listen, continue to innovate, and proudly include the essence of their storied lineage into the soul of every yacht that the produce. The countertops on the C52 galley feature a recessed sink with a cover that provides the galley with a huge amount of open counter space. 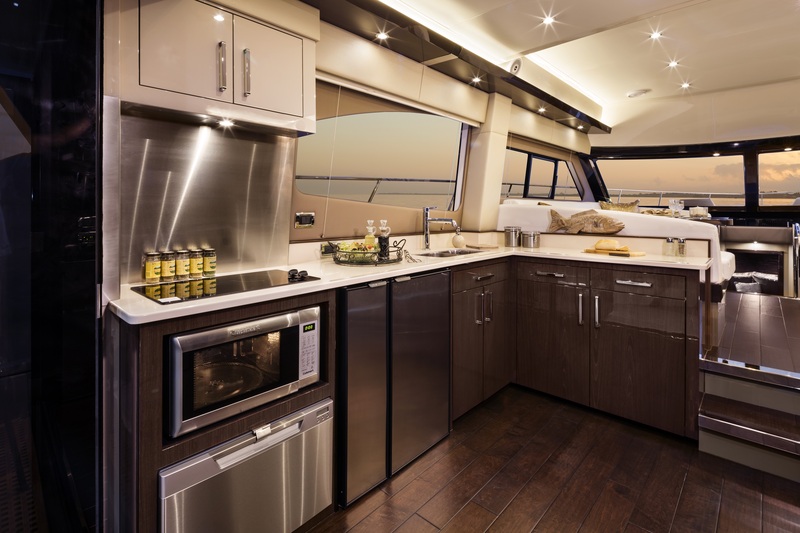 With its large amount of space and appointments the galley feels like what you would expect from your kitchen at home. An optional wine cooler and dish washer can be added, but regardless of the confguration you choose, you will see that there is ample storage in the handcrafted drawers and cabinets. There are 2 refrigerator drawers and 2 freezer drawers in the galley that provide plenty of refrigeration space. 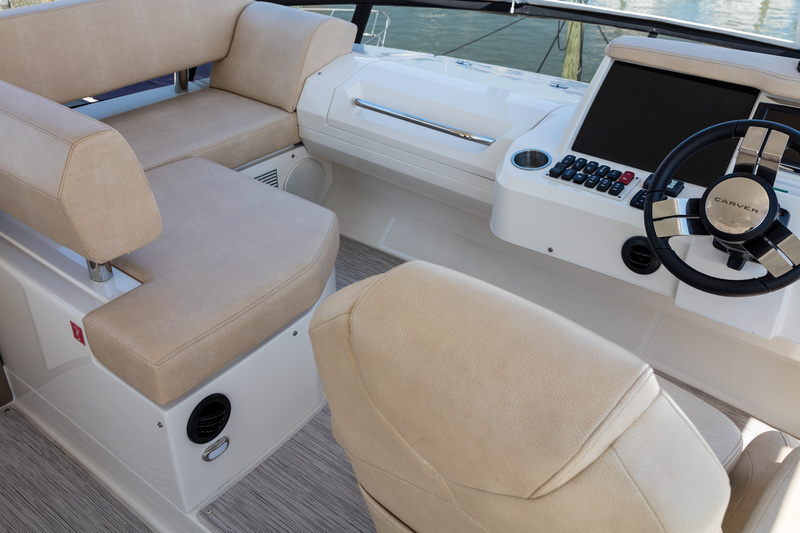 As the central location on the C52’s main deck, the galleys abundant space and inviting feel o?ers the same dynamics that you find while entertaining at home. Everyone likes to congregate at the center of activity! 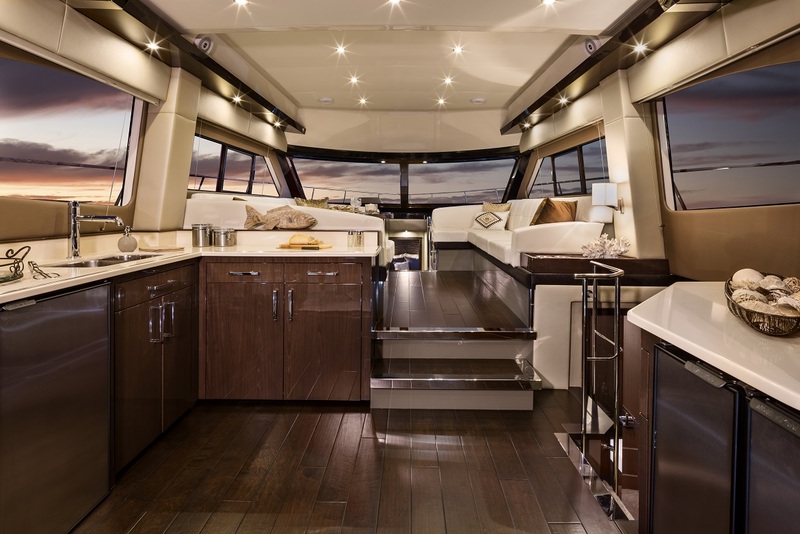 The raised salon forward is an inviting space that provides impressively comfortable wraparound seating port and starboard with 360-degree views all around. For gathering to have a conversation about plans for the day or enjoying a gourmet meal around the elegant teak dining table this space is meant to be warm and inviting.